Are you house-proud, yet frustrated that your standard oven cleaning doesn’t get the grime, stains, grease and other deposits out from your oven? Let us do you proud, by delivering professional deep cleans that removes burn residues and grease from every unreachable nook and cranny of your oven. We offer homes and commercial establishments across Bristol an end-to-end domestic cleaning service of all types of ovens, hobs and cookers. Our trained cleaners use non-toxic cleaning equipment and products to give your oven a brand new look and make it a more efficient and long-lasting appliance. Our cleaners deliver oven cleaning services with minimal inconvenience to you, and ensure that it is ready-to-use soon after. Our service is fully insured to give you the assurance of a quality job. We provide fully trained and referenced cleaners who can do a thorough clean of your oven within two hours, based on the model you have. Check out the competitive rates we offer to all customers. 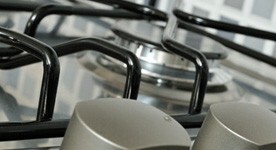 Speak to our dedicated staff for a free oven cleaning quote, on 0117 345 9015.